There was one question heard over and over again at the refugee rally on the steps of the Idaho Capitol Saturday. A diverse, respectful and peaceful crowd listens to speakers on the steps of the Capitol. It was a crisp yet sunny day. Jefferson Street bisected two groups of Americans who are further apart politically than any street is wide. On the Capitol side, 700 people rallied for the American values of strength, compassion, inclusion, and acceptance. On the other side of the street, 175 people rallied for the American values of fear, intolerance, xenophobia, and hate. Don’t doubt it. All of these values are American values. It’s been well documented what happens when American policymakers succumb to those latter values. Few Americans are prideful of the Japanese internment camps of World War II or this country’s refusal to accept Jewish refugees in 1939. A man, who heckled loudly during the refugee rally, yells at attendees. Naively, we thought those days were behind us. Saturday proved those illusions are wrong. Not only is there a lot of anger in this country, the anger is blowing over. It’s important to note that the protesters on Saturday were not a loose confederation of angry uncles. They were organized by two groups. One was ACT! For America, a radical anti-Muslim group that has tapped into the bigotry of the far right. Eric Parker at the Bundy ranch (top) and at the Capitol on Saturday. The other group is the III%, a para-military extremist group that has gone from supporting illegal grazing and mining operations to embracing an anti-everybody-else agenda. The group claims to be defending the Constitution. The III% gained national notoriety when its vice president, Eric Parker, was photographed pointing an assault rifle at BLM law enforcement officers during the Cliven Bundy standoff in Nevada. Apparently, the III% thinks the Constitution is keen on old men stealing from U.S. taxpayers. Parker was also at Saturday’s rally. He wore an earpiece like a security officer and waved the stars and stripes to remind rally-goers that his values of hostility and exclusion are deeply embedded in the psyche of too many Americans. Ten years ago, I would have dismissed Parker and the III% as anti-government radicals who have no influence on the civic process. Gradually, we’ve seen the radicals’ values slip into the mainstream. Long before the issue of Syrian refugees went national, Idaho’s right wing was stoking the fires of fear. In March, Rep. Vito Barbieri invited an anti-Muslim pastor to the Capitol to speak. That talk led to a special session after nine GOP lawmakers — citing irrational fears of sharia law — killed funding for the state’s child support enforcement. Months later, a group founded by a right-wing militant Rick Martin began an assault against the College of Southern Idaho’s Refugee Center. Ten years ago, Barbieri and Martin would have been easily dismissed as unhinged loonies on the other side of the street. Today, in the era of Trump, they have company. On this issue, Sens. Crapo and Risch, Reps. Labrador and Simpson and Gov. Otter all embrace the values of Barbieri, Martin, and the III%. They have decided that 10,000 heavily-vetted Syrian war refugees — the victims of ISIS and the Syrian despot, Bashar al-Assad — are an existential threat. Never mind that nearly 70 million foreigners travel through this country every year and 18 million of those aren’t even required to get a visa. 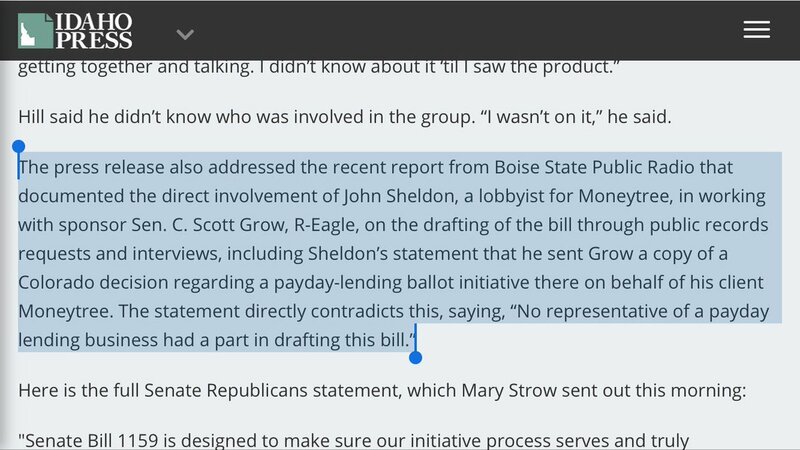 Unfortunately, the militant fringe has a record of influencing public policy in Idaho. The results are never good. In 2013, a Utahan named Ken Ivory started an anti-government movement that demands the privatization of our public lands. Instead of brushing him off, Idaho lawmakers voted to study his unconstitutional plan. Last summer, the radical right disrupted the Idaho GOP’s state convention over healthcare reform. To this day, 78,000 working Idahoans have no access to health insurance. In May, irrational fears of sharia law prompted a special legislative session after GOP lawmakers voted against a child support enforcement bill that provided Idaho’s single-parent families with $200 million in payments they are owed. Using tepid language that has been criticized by the militant right, Gov. Otter on Monday succumbed to America’s darker values and asked that the U.S. refugee program be halted. The meek verbiage suggests he was uncomfortable with the decision. Meanwhile, his wife said he was wrong. So what the hell happened to our country? It’s not like the far right didn’t exist until recently. It’s always been there, festering in the shadows. What’s really happening to our country isn’t so much about them. Instead, it has to do with a political party and its politicians who stand, shoulder to shoulder, with the militant right. He’s the Idaho Republican Party Chairman. If you think 10,000 refugees in a nation of 350 million people is an invasion, you should probably be hanging out with Parker and the III% clan of Know-Nothings. American values are diverse. On occasion, Americans succumb to the dark values of fear, intolerance, xenophobia, and hate. On Saturday, those values were well represented. It is our responsibility to keep those values out of the civic process. It would be nice if Republicans felt the same way. The truth is, they should. Because if GOP leaders aren’t careful, their party is going to look like this.